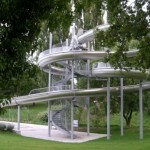 Water slides enable young and old to safely enjoy the pleasures of water and sliding. 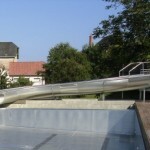 They come in half-tube and full tube sections with the slide bed surface in stainless steel (V4A quality or NF1.4401) and can be specified with a polycarbonate canopy (transparent for a panoramic vision or black). All types of shapes can be created, whether gentle curves, abrupt bends, rebounds, descents and helical turns for example, with varying slopes for each section. Light effects can be included to provide the user with different sensations for each run. The opaque part of the tube is immersed in a halo of light generated by LED lighting, with a mixture of 16.7 million colors. Fast or slow colour changes, grouped or separated clusters of lights, the effects of current or strobe lighting can be fully automated for countless variations. For maximum safety, user traffic is managed by a traffic light combined with a timer or a photovoltaic sensor. 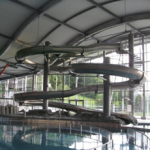 Slides in stainless steel with a ground anchor can be built without foundations. They are manufactured to the dimensions and shapes chosen and specified by the customer, and fit perfectly into their environment.